This operation is intended for memory and culture in order to reinforce the Franco-German friendship through adventure diving and the underwater heritage. 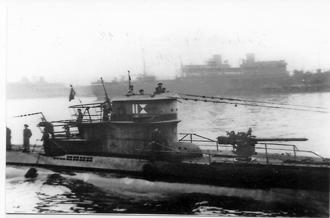 Thus, a team of l'Expedition Scyllias and Taucher Gruppe U-Boot-Archiv divers will discover several wrecks of WWII German ships sunk off Brittany and Normandy. 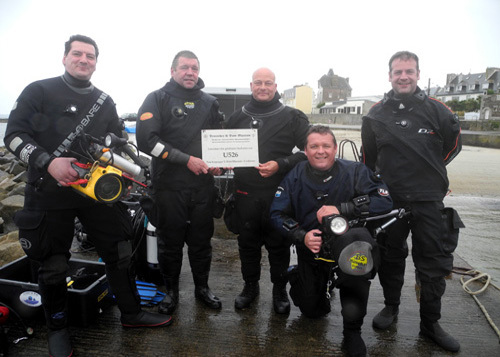 This Franco-German team will meet national or international experienced divers including several professionals. Two editors of diving magazines will join us : Thomas Becker for Wetnotes and Paul Poivert for Octopus. The projet 44 wants to salute the memory of sailors of all nationalities missing in action. It refers to the year 1944 which marks the loss of all the ships forming the basis for this project. 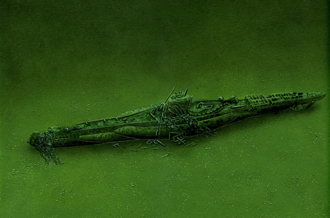 Among many shipwrecks that lie off the French coast, eight have caught our attention, some of which have already been the subject of investigation dives and archival researches. 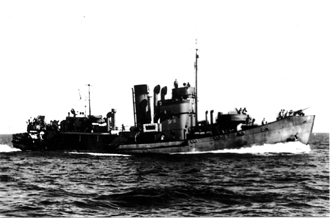 Three of the selected topics : U 390 at training ; a 14.UJFlottille submarine chaser; wreck of U 767 by Olivier Brichet. Normandy (bay of Seine) : submarines U 390 (-50m), U 741 (-55m) and U unknown (-55m). All are German sunken ships, all disappeared with most of their crews during fierce fighting. Each wreck will be filmed and photographed in the highest regard imposed by these underwater graves and a wreath will be deposited in memory of sailors and submariners missing. U unknown will be an action of special investigation for identification. Alongside dives, joint actions regarding archival researches will take place in Hamburg, Cuxhaven, Kiel, Freiburg and Koblenz. Three museum ships will also be the focus of our attention and will appear in a book which will include a museum section relating each time with the topics : U 995 in Germany, HMCS Haida in Canada and ORP Blyskawica in Poland. These land actions will be performed in compliance with this Franco-German concept of working together. The establishment of the team will be variable and adaptable to suit the availability of members and their technical capabilities. Oliver Thiel (trimix diver and logistics coordinator). Oliver Meise (diver and historian). Jean-Louis Maurette (underwater photographer, coordinator and writer). Hugues Priol (trimix diver and underwater cameraman). To close all these actions which will be reported by German and French media, a bilingual book will be published. This 200-page book, size 19x26, will involve, for each peril, a enriched historical part with a nice iconography and a underwater part. Artists views will complete each chapter. The completion of this work will be carried by éditions Grand Blockhaus, specialized in publishing history books business and directed by Luc and Marc Braeuer, curators of three museums (Le Grand Blockhaus de Batz-sur-Mer - Le mémorial de Quinéville and Le Bunker de La Rochelle), Franco-German origin historians and with whom we have been working for several years. Land and underwater views will also be undertaken in order to promote our work through an audiovisual documentary intended to festivals of the image. The overall budget for the book - first printing in 2,000 copies, reprints being funded by the profit from sales - and a first portion of the actions is EUR 20,000. This is a budget for launching the edition of publication (translation, layout, correcting, printing, distribution, copyrights, etc.) although a small portion will be used to start, to the extent possible, the first underwater actions. It is necessary to use a second funding to achieve all underwater activities scheduled. Several options are available, ranging from the acquisition of a Rigid Inflated Boat to the renting of boats, budget oscillating from EUR 20,000 (rental) to EUR 100,000 (purchasing boat + towing vehicle + operating budget), bearing in mind that a permanently available boat to the Franco-German team would allow a remarkable and unique action over several years. 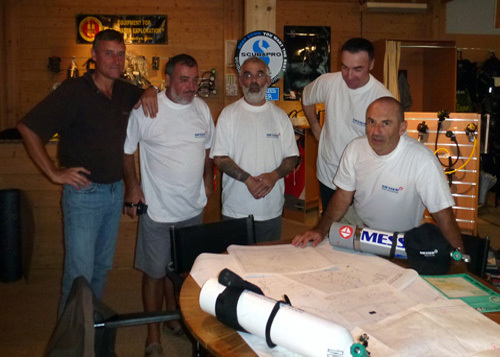 We already have the support of Messer for the supply of gases intended to deep dives. We also have the support of Aqua Lung for the supply of dive equipments. support Projet 44 team !